I've noticed a lot of the time, high-end biscuits and cookies seem to equate "luxury" with including butter in the ingredients. Can anyone point me in the direction of any quality biscuits (preferably of the stuffed full of chocolate/nuts/dried fruit variety) that are either accidentally or purposefully vegan? I do realise I could make my own, but I want some pre-packaged ones to keep on standby. I'm not sure if it's exactly what you want and I expect you know about them already - but those tiffin things they sell in the allergy section of Waitrose must be "quality" judging by the price At any rate I have taken them to posh picnics etc and they seem to go down well with everyone including omnivores. They have millionaire's shortbread as well but the underneath part of those is a bit strange IMO. I agree about the Millionaire shortbread! You could try these in Morrisons - they seem accidentally vegan. Also I can vouch for the Dame Blanch ones in VX but they seem to have vanished. I also like Doves Farm double choc chip- they are expensive (therefore should be luxury) but are a bit dry. I also love Nana's from VeganStore. Other than that you could try covering Bourbon's in melted chocolate and having Vegan penguins! what a simply WONDERFUL idea!!!!!!! Also those Nairns' oatcakes that have fruit and stuff in them are vegan I believe (they may contain palm oil though). Not sure if they are luxurious enough for twinkle's purposes, but they are widely available and quite popular. Went to Morrisons today and got some of the double chocolate and double chocolate with orange big cookies Firestorm mentioned, and they were on special offer - bonus! Let the music mend our minds. Let the music bend our minds. If you are after quality wheat, gluten and dairy-free biscuits with no additives, try 'Against the Grain' biscuits with choices that include choc chip, fruit, almond, ginger. I have just been to Sainsburys and seen that they have choc chip pnb! I found these biscuits in Wholefoods in Kensington a little while ago, and they're really yummy (and luxury!) They cost I think around £2.99 and had other flavours. The company is called Against The Grain and all of the products are suitable for vegans. Here the spread is not that expensive 2.95 EUR (/ 2.54 GBP / 4.08 USD) for 700 grams. There are other brands (supermarket own brand) that are cheaper and good too. I've been looking into getting some to Canada and it's crazy expensive in shipping. Hey see my post 2 above.......I thought I found these first! Oh sorry, haha! Completely missed your comment! Some of the Traidcraft ones that they sell in Oxfam shops now seem to be vegan - the ones with fruit, nuts and chocolate (not necessarily in that order). They have a x-contamination warning for the chocolate chips but otherwise look OK to me and I thought they were pretty good. Gywdion sent me some of those, and the stem ginger ones in my food swap parcel, they're really good! Oh, I must try those as well then, Blueberries (not that biscuits are really one of the things that are missing from my diet ). Traidcraft also seem to do some muesli and stuff that's vegan now - at one time it all seemed to have honey in it. 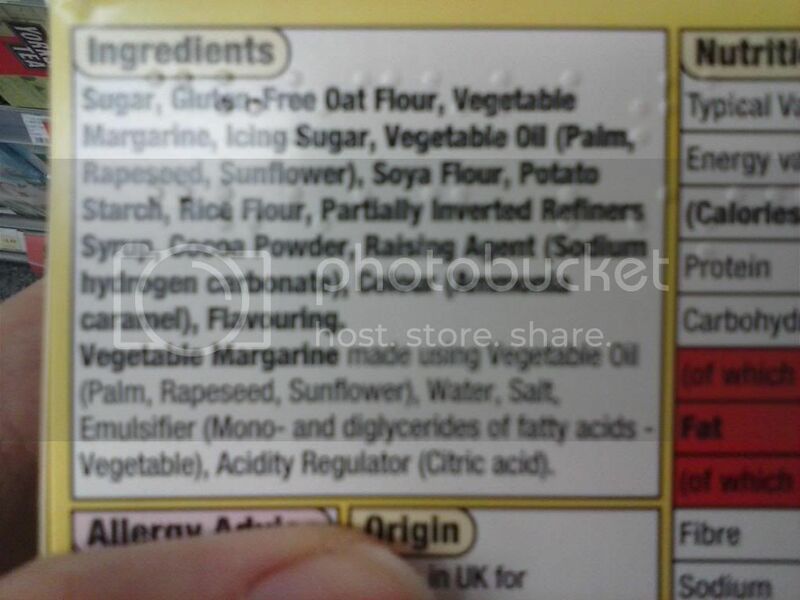 I always avoid the ones which contain palm oil in it. Whereas you are not supporting the meat industry, palm oil causes the dead of thousands of orangutans, oblige people leave the place where they live in and is triggering asasination of peasants. Palm oil is NOT vegan.